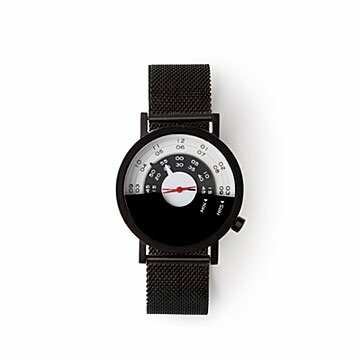 By keeping time "above the horizon," this sleek watch captures the feeling of Earth's great expanse. The line where the ground and the sky meet is visible anywhere you are on Earth. By keeping time "above the horizon," this sleek watch captures the feeling of that great expanse. The bottom half of the face is black, while a half circle containing an arch of numbers completes the top. Since the outer ring holds the hours and the inner ring keeps minutes, the watch's hands never dip below the meeting point. The allusion to the endless skyline not only symbolizes limitless possibility, it also serves as a reminder to consider the bigger picture. Running late? Stuck in an appointment that's run over? Don't worry, every moment is just one of many on the horizon. Made in Spain.